If you are an IT organization that believes in working smartly and efficiently, the odds are high that you would have heard of Kanban, a framework that is being increasingly adopted by your peers in the IT industry. While considering implementing Kanban for your team, the most important decision that you would have to possibly make is to decide which tool to use. In this blog, we will look at why your organization should consider adopting a Kanban app and the key features to look for while shortlisting a Kanban app for your team. In recent years, Kanban has become increasingly popular in application development to optimize workflow processes and improve efficiency. The relevance of Kanban has increased as more and more organizations adopt cloud-based SaaS applications which require continuous delivery. The percentage of respondents who practiced Kanban techniques increased from 31 percent in 2014 to 39 percent in 2015. Kanban is a framework that was invented by Toyota in Japan and was modified by David Anderson for software development. It offers a visual process management system that aids in effective decision making and helping everyone on the team stay up to date. During the early days of Kanban, factory workers working in assembly lines used a system of cards to represent steps in the process and a physical board to view it. However, the software world is more complex with multiple teams located in separate offices across the world which makes it impractical to have a physical board to manage application development processes. To address these challenges, a number of Kanban apps have emerged that help make Kanban work for such project teams. Before we get into the details of what are the factors to consider while selecting a Kanban app, it would be worthwhile to understand a few principles of Kanban in Application Development. Visualization: The word Kanban in Japanese roughly translates to ‘cards you can see’. Therefore, visualization in the form of Kanban board is at the heart of Kanban. Kanban board is a simple whiteboard with three distinct phases represented as three columns – To do, In Progress, and Done. The board offers visibility into the process and helps identify and resolve workflow problems. Limit Work in Progress: This is perhaps the most distinguishing feature of Kanban and different from methodologies like Scrum to manage scope. Limiting WIP focuses on using a pull system to match team’s development capability. Manage flow: This involves monitoring, measuring, and reporting the flow of work through each stage. This helps identify where the workflow is stalled and work on removing the bottlenecks. Make Process Policies explicitly: This involves describing the process accurately by thinking of the process as a set of policies. Improve continuously: This involves tracking key metrics such as total work in progress, lead time to build a culture of continuous and collaborative improvement. Which is the right Kanban app for me? With a plethora of Kanban apps available at different price points, it might be a challenging task to even shortlist them. It is important to understand the criteria that you need to choose for selecting the right Kanban app. 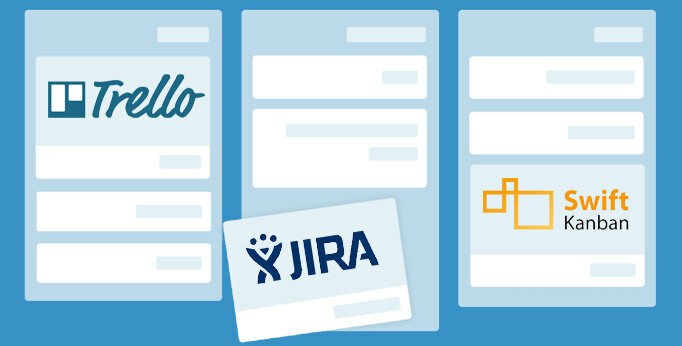 We have put together a list of top 5 things to look for while selecting a Kanban app. Visibility – Does the Kanban board represent your process accurately? Does it provide the ability to track key metrics, reports and analytics? Does the app offers in-built metrics that can be used to quickly create reports to track performance? Does the app offer visibility at different levels within the organization – Portfolio, Program, or Project level? Does the app allow download and export of report data to multiple formats? User Friendliness – Is it easy to design a Kanban board on the system? Is it easy to interpret the board and quickly spot bottlenecks? Is the user interface intuitive? Does it offer visual cues in the form of color codes to indicate task priority? Can your technical as well as non-technical team members adopt it quickly? Flexibility – Can separate development teams customize the Kanban app to suit unique requirements of their process? Is the app good enough to adapt as your process evolves and becomes more complex? Does the app offer a mobile version so that your team stays on top of the development projects at office or on the go? Administration and Security – As the application scales from single, co-located team to multiple, geographically distributed teams, does administering the app becomes an overhead? Does the app provide access management system to control designated users? What security standard does the app supports? Does the app support encryption? Can the app be hosted in-house as well as on cloud? Integration with other products – Can the app easily adapt to your in your current technology environment? Can the app integrate with existing tools for collaboration, file sharing, project management, etc.? Does the app offers APIs that can be used to integrate with other apps? Does the app allow collaboration and update of status using email? Are you evaluating a Kanban app or already using one? Let us know your thoughts on the blog and if you think there is some other criteria that one needs to consider while selecting the app. Also, feel free to ask any questions related to Kanban apps. This is a guest blog post written by Nishanth Appaiah Mittu. He’s been helping Digite, a company providing enterprise agility and integrated project management software platforms for IT companies. He has been managing their Marketing function for the past 3.5 years. In a previous life, he helped test out ideas for cognitive radios at CEDT, IISc post which he went hunting for the best biryani and prawn curry in and around IIM Kozhikode. What’s your opinion? What Kanban Software are you using? Don’t hesitate to drop your comments below. We will answer all of them! I generally send one newsletter a month. You’ll get compact and useful essays on innovative agile practices. I promise there will be no spam! You can unsubscribe at any time! Your information will *never* be shared or sold to a 3rd party. I’m Dominic. My aim is to describe my experiences, failures and successes in my daily work as an Agile Coach.